Randy Cassingham’s mission in life is to get people to think. 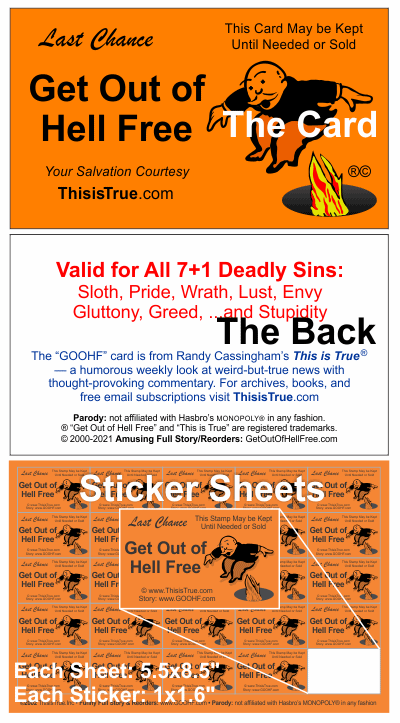 His email magazine This is True® (basic subscriptions have been free since 1994 — Click Here for Subscription Form) is the flagship for that: the weird-but-true stories entertain (so people will read it), but over time, you can’t help but think about the issues raised. Years ago, a reader thought a 100ish-word story about the Chinese art of feng shui was “anti-Christian” and that therefore, because he wrote it, Randy is (without a doubt!) going to hell. Randy figured that if a self-appointed moralist could condemn people to hell with the snap of her mind, he certainly had the power to get them out again. Thus the Get Out of Hell Free (or “GOOHF”) card was born. Designed by Randy himself, he offered them to his readers for the cost of their production and mailing — and they went wild, ordering 100, 500, and more at a time …and then coming back for more. Someone at the door interrupting dinner wants to convert you? No need, you can tell them: you’re already saved. They’ll be trying to figure out the card as the door slams. Want a great way to tell your boss you quit? A GOOHF card says it all. A nasty customer is rude to a sales clerk? Starting your transaction by handing her a card will make her day (waitresses especially love them). They are a lot of fun to hand out! Randy’s given away many thousands, and still enjoys it. Hence our slogan: Sin all you want, we’ll print more. GOOHF cards are business card-sized (2×3.5″) and printed in USA on heavy matte card stock. They’re just $10 per pack of 100 cards, plus shipping. For large quantities, Jumbo Packs are available at a discount for your mass salvation needs. “>Order either one here. GOOHF Stickers! Sheets of 25 1×1.6″ stickers are perfect for your mail, books, locker, shirt and other spots. Just $5 for five sheets — 125 stickers in all! And more! Laser-engraved sticky note holders, static-cling window decals, and other items: check our shopping cart for all of the available GOOHF Goodies, including our popular long-lasting plastic GOOHF cards. Buy only what you need: because the cards are priced at the break-even point, they are not returnable. Or See other order quantities/options. © Copyright 2000-2019 ThisIsTrue.Inc, All Rights Reserved worldwide. ® “Get Out of Hell Free” is a registered trademark, USPTO, and may not be used without prior, written permission. Note: This product is not affiliated with, nor authorized, endorsed or licensed in any way, by Hasbro Corp, its affiliates or subsidiaries. It is a parody.